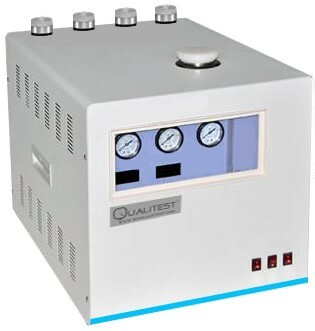 QT-GGE-300 Gas Generator generates high purity nitrogen, hydrogen and air. It can supply stable and high quality gas for Gas Chromatography. Gas source supply for gas chromatography, machine can be used to replace the inconvenient large size gas cylinder. User friendly, stable pressure output and gas flow meter. Machine does not consume any other electrolyte solute, only distilled water is needed. Durable design, Machine can work continuously for a long time.